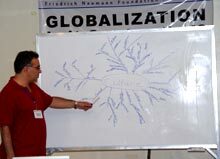 After two successful Liberal Leadership Training (LLT) seminars on local government and market economy, the Friedrich Naumann Foundation (FNF) broke new ground by offering its latest LLT online from 05 March – 01 April 2007. 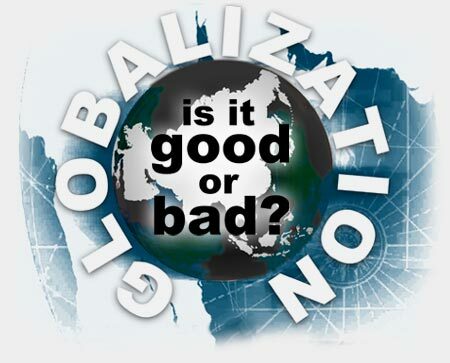 The chosen topic was “Globalization” due to widespread interest. 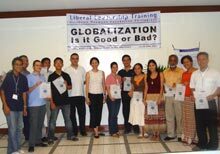 Over 50 participants shared their views on the driving forces of globalization, its impact on poverty and on whether it was more beneficial than isolationism. Joining the Filipinos were several participants from Malaysia, Indonesia and Thailand. The seminar was divided into three phases. In the first part, participants were given materials to supplement their knowledge. The participants then discussed their views and insights through an online forum. Lastly, participants completed the seminar by answering a short test and by submitting an essay. “The topic evolved from the discussions of the last LLT on market economy,” FNF Resident Representative Siegfried Herzog pointed out. “It is a topic that raises strong emotions all over the globe, and you could see that in our online forum. Having a detailed discussion with people from the wider region has helped to deepen our understanding of the character of the process, its risks and its opportunities,” he added. Based on their online contribution, FNF selected 12 participants to continue discussions in Panglao Island, Bohol from 22-26 April 2007. Four regional participants joined the Filipinos for the three day workshop that centered on the most debated online topics: Globalization vis à vis poverty, human rights, culture and international politics. Participants analyzed the Economic Freedom Index and examined the data of the represented countries in relation to poverty. They then debated on whether globalization impinged on human rights, and mapped out its direct and indirect effects on culture. The workshop ended by discussing whether a benevolent super power, a concert of powers or strengthening the United Nations (U.N.) would be the best system of governance in a globalized world. Participants agreed that despite the failures of the multilateral system of the U.N., it still offers the most non-discriminatory representation for all countries, while allowing globalization to flourish with less political interference from big powers.